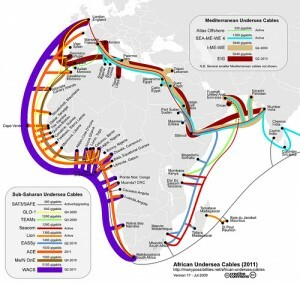 The arrival of the GLO-1 submarine cable  in Lagos this weekend has West African bloggers excited. GLO-1 connects Nigeria and 13 other West African countries to the global telecommunications system via Europe, bringing new bandwidth to the region. Map via Many Possibilities . In late July, damage to the SAT-3 cable  — which until last weekend was Nigeria's only link to the global communications system — crippled  bank services and Internet access throughout the country. Approximately 70 percent  of the country's bandwidth was affected. According to  the Chief Operating Officer of Globacom Limited, which financed the GLO-1 project, the new system will be able to meet all of Nigeria's broadband needs for the next 15 to 20 years. Bloggers are looking forward to faster speeds and cheaper and more reliable access. The interesting thing about the cable is that unlike other ventures like Seacom  [Editor's Note: Seacom, a cable connecting the eastern African coastline to Europe and Asia, went live  in July 2009], this venture was entirely financed by Glo alone. The consequences of the Glo-1 are major, but will probably take a while to take effect. This as with Seacom is a great moment for African technological innovation and development.